As our bodies age, we start to have greater difficulty with a whole host of activities. Sometimes even the act of walking can be challenging. Faced with complex medical conditions or simply old age, walking is an ordinary task that can be difficult to accomplish in a safe manner. These difficulties often show themselves in several ways. The first being through poor endurance and is often visible by the need for frequent rest breaks even on short walks. Secondly, issues with balance may be seen through the occurrence of falls or a reliance on nearby walls, objects and furniture to support mobility. In some of these cases, a rollator walker may be an appropriate mobility aid to increase one’s walking endurance and help prevent falls. That said, four wheeled walkers are also one of the most commonly misused items that place the elderly at high risk of injury and/or death from falls. We shall highlight the different mistakes that are made by seniors and this will be followed up by a discussion on what can be done to avoid these issues. Rollator walkers can be used to enhance safety with walking. Some government agencies consider four wheeled walkers to be an essential aid in supporting quality of life and may even provide funding to assist with purchasing a walker. In these cases, there are often thick applications that specifically trained occupational therapists or physiotherapists can help with completing as they make recommendations on the appropriate walker. Because not all people are the same, not all walkers are the same either. There are many different variations among them their features, add-ons, and measurements. Some people may benefit from one feature, but others may find it to be a hindrance or even dangerous. In cases where a trained health care professional is involved, these issues are considered and walkers are prescribed to the individual. Issues may pop up when one obtains a walker privately without the involvement of the appropriate healthcare worker. 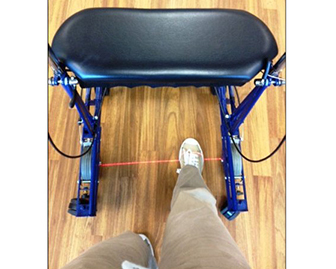 While this may save one the cost of associated with a mobility assessment, it may put the walker user at risk. The most prevalent problem is that walkers are inappropriately fitted to the individual. For instance, the handlebars of a walker need to be roughly at wrist level when one is standing and has their arms down at their side. Handles are usually too tall which forces one to ambulate further from the walker or too low which forces one to have a hunched back as they are walking. In either case, both of these situations are less than ideal and can contribute to falls. But not all may be lost. Handle bars can be adjusted to a certain degree, however most walker models cannot be lowered or raised past a certain point. For instance, the adjustable handle heights for a popular brand of walkers can vary among the three different models offered. For the superlow model, the range is from 30.5-33.5 inches tall, 31.5 to 36.5 inches on the low model and finally 32.5 to 39.5 inches on the standard size. As a result, one needs to consider their arm length when selecting their walker. Some models can also offer interchangeable tall handles which can increase the height of the handles on walkers, however this comes with an added cost and installation fees for the modification. Ideally, you’d want to select the most appropriate walker right from the beginning. If you thought purchasing a walker was complicated, just wait till you consider the seat height into the equation. The problem with seat heights is that they are not adjustable. As a result, this needs to be looked at prior to making any purchasing decisions. Generally, a seat that is too low for someone is a difficult surface to attempt to stand up from a sitting position. That said, if the surface is too tall, one would have difficulty getting onto the seat and it will not be able to serve its purpose of allowing the user to rest periodically between small bouts of mobility. In essence, it is best to select a walker with an ideal seat height for the individual. Because armrests are adjustable and seat heights are not, generally you assign a little more priority to seat height when considering a specific walker. One can end up with a slight mismatch of the exact arm handle height and seat height that is required and the walker is not an ideal fit, but it should be supportive enough. Once again, a trained healthcare worker with some input from the medical vendor that is selling you the device can help with narrowing down your options. Now that a walker is in the home, the greatest issue that leads to injury and/or death is inappropriate usage of the walker. Impaired cognition and decreased ability to retain memories may play a factor in seniors forgetting to lock the walker brakes prior to leaving or starting to use the device. As an example, seniors often leave the brakes on the walker disengaged and rely too much on the device to support themselves as they get up from a chair or couch into standing. 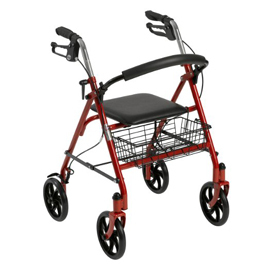 This places them at risk of falls as the walker will have a tendency to run away from the user if they are pushing on the edge of the handles for a boost to get into standing. Some may even fall forward onto their face while the walker propels ahead. Another issue is that seniors attempt to leave their walker without engaging their brakes. This becomes an issue when the individual holds onto their walker as they attempt to gently sit or reach for something in a high cupboard. As a result of the brakes being free of restraint, the walker moves away from the user leaving them unsupported and at risk of falling. Walkers are sometimes abandoned at doorways or other parts of the home because they cannot pass or be used in a cluttered environment. Abandoning the device means one has no supportive device at all and one can easily fall as a result. We will discuss ways to rectify this issue in the next section. Some seniors have a walker because of poor standing tolerance or endurance. This sometimes translates into a poor ability to ambulate long distances. It is common to see the elderly sitting on the walker seat and propelling the walker in a certain direction with their feet. This is unsafe for several reasons. The seat is made only for short duration rest brakes until one regains the energy needed to walk again. If one sits the pushes with their feet, the walker could easily tip and cause a fall. The walker should not be used as a wheelchair and it should never be pushed or rolled when someone is sitting on it. One last problem we should mention is that walkers are often left inappropriately far away from one’s chair, couch or bed. This serves the user no purpose and places them at risk. If one has to walk without any support to reach the walker or from the walker to the sitting surface, then the mobility aid serves no real purpose in protecting them. Now that we’ve discussed the various mistakes made when selecting a walker and with mobility aid usage, let’s talk about some strategies and techniques that can be done to minimize the injuries that commonly result from these lapses in judgment. First, it is incredibly important that an occupational therapist or physiotherapist assess one’s mobility and environmental context in which the mobility aid will be used. When selecting a walker for the person, one’s environment is also considered as not all homes have ample space to allow free movement of a wide walker. More importantly, the therapist can provide training and reinforcement on how to actually use the walker safely. Especially with a new device, multiple training sessions are required to ensure that the correct strategies are cemented into one’s memory and actions. In terms of overlooking the brakes when using the walker, what has been done in some situations is to mark the brake handles with brightly colored tape. This brings a significant amount of contrast to the brakes and can trigger as a reminder to the user that the brakes need to be engaged prior to getting up to use the walker and to leaving the walker to sit. Hopefully the brightly colored handle will now bring attention to it, however without proper training the user will not know what this means. In the end, the most important thing is repeated training session until the user and their teachers are fully confident in their ability to independently use the walker safely. U Step walkers have the ability to add a laser light module to help guide one as to where their feet should be during motion. This encourages safe walker usage and minimizes falls. Even when walkers are measured correctly, seniors have a tendency to ambulate with their walker too far in front of them. Ideally, one should be walking between the two handle bars with each step. This can be achieved by making sure the handlebars are set at the appropriate height, but there is a module that can be utilized for U Step walking stabilizer specifically. This walker allows a special guiding laser to be connected to the walker to project a line onto the floor to tell the user where they should be positioning their feet when they walk. This helps to bring the user closer to their walker and promotes walking with a straight and tall back. This contributes to safer walking, but also helps with maintaining control of the walker and ensuring one’s balance is supported by the device itself to some degree. Lastly when walkers are abandoned due to poor pathway clearance, it is important to declutter the home. Free up as much room as possible and even rearrange furniture if needed to allow the user and the device the pass by. Any room that is inaccessible with the walker should not be used by someone that has a mobility impairment. Also when doors are narrow and prevent the walker from passing through, consider using offset expandable hinges to increase the usable door width. This strategy is commonly used on bathroom doorways of older homes that were constructed using old building standards that allowed for narrow passageways.